Brian Burke, President and General Manager of the Toronto Maple Leafs, announced Monday that the hockey club has signed forward Tyler Brenner to a two-year entry level contract. Brenner will report to the American Hockey League’s Toronto Marlies for the remainder of the season. 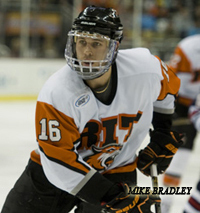 Brenner, a 22-year-old native of Linwood, Ontario, has played the last three seasons for the NCAA’s Rochester Institute of Technology Tigers (RIT). This season the 6-2, 200-pound forward played 37 games for RIT registering 26 goals, 15 assists and 41 points along with 39 penalty minutes. He ranked first on the Tigers in goals and powerplay goals (11), and second in points. He was named the Atlantic Hockey Association’s (AHA) player of the week for the period ending January 2 when he recorded eight points (six goals, two assists) in three games. As well, he became the fifth player in RIT history to record 100 career points when he scored a goal March 11 in the AHA Quarterfinals. In 2008-09, he was named to the AHA All-Rookie Team. The Toronto Marlies’ next home game will take place on Saturday, March 26 at 3 p.m. when they host the Lake Erie Monsters (AHL affiliate of the Colorado Avalanche) at Ricoh Coliseum. For ticket information, including season ticket packages and priority seating, visit www.marlies.ca or call the team’s ticket line at 416-597-PUCK.